2. Reykjavik is the most northerly capital city in the world and its north touches the Arctic Circle. 3. The bargain basement frozen food shop 'Iceland' actually exists here. Yes, here. In Iceland. 4. Iceland is the best place to be if you are a woman. It has been ranked number 1 in the world for gender equality for seven years running. It’s also the most gay friendly country in the world. 5. Everyone speaks English as well as Icelandic. 6. The Icelandic language sounds Celtic with a side order of bubbles tripping over icicles. 7. The sky and surrounding mountains- turn all the colours of the rainbow at sunrise and sunset. Kerið crater lake is a volcano that erupted 6500 years ago. 8. After the financial crisis in 2008, Iceland jailed the bankers and took the Prime Minister to court for negligence. The entire system collapsed and they started again. Iceland's financial system works much better this time. 10. Try not to let your hair go under the water in a thermal spa. The silicone in the water turns it to straw. Conditioning before you go in helps- unless you want dreadlocks in which case, you’re in luck. 11. Yes the cost of living is high- but so is the quality of life. 12. Heating and hot water comes directly from a geothermal source- which means heating is available to everyone and your hot water will never run out. In fact all of Iceland's power come from Geothermal sources and they no longer use fossil fuels at all. 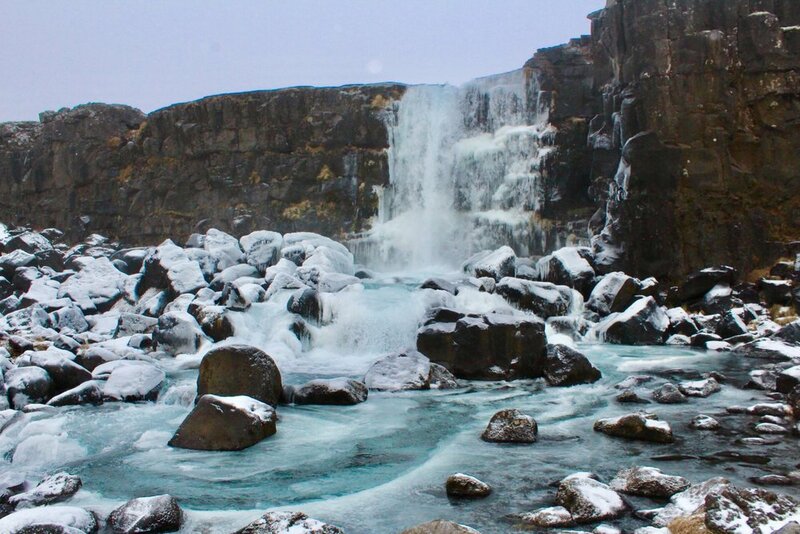 Partially frozen waterfall at Thingvellir National Park. ICE BLUE is a real colour. 13. Geothermal energy is used to heat pavements in Reykjavik so they are clear of ice and snow. 14. The air and water are clean, even if the tap water does smell a bit eggy from the sulphur. 15. Sulphur (in water) + silver (jewellery) = silver sulphide. This leaves a black tarnish which luckily can be scrubbed off with toothpaste. 16. Like to see sunrises? Like to stay in bed? Iceland in the winter is for you! In November the sun rise at 9am, so early starts are not necessary. Hooray! 17. Iceland has a Scandinavian feel to it. No surprise when you realise they were ruled by the Danish till 1944. 18. Iceland has no military. 19. Amongst the freezing mountains and exploding Geysir, there are streams of boiling hot water running along the ground. This is a land of magical extremes. 21. The fields of lava rock look like mars (with added moss). 22. Nature. Every turn in the road and every brow of a hill presented a breathtaking view ever changing according to the weather and the light. This is beauty on an epic scale which feels good for the soul.